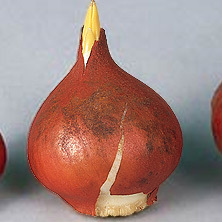 One of the most frequently asked questions about planting bulbs is, “Which end goes up?” Most true bulbs, such as Tulips and Daffodils, have pointed tips which should point upward. Corms, tubers and rhizomes usually show sprouts on their upper sides, and these should be on top when planted. Some of the smaller bulbs, such as Poppy Anemones, look like small dried peas or small stones and can be planted in any direction – their shoots will find their way toward the sun.